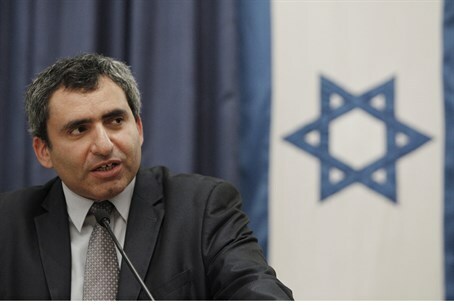 'We must beat Hamas until it waves a white flag,' MK Ze'ev Elkin declares. MK Ze'ev Elkin (Likud) slammed Israel's 'humanitarian ceasefires' in Gaza on Wednesday, noting that they are causing 'great damage' to Israel. "All this walking towards [these] humanitarian ceasefires - or not - is a big mistake," Elkin said, in a special interview with Arutz Sheva. "Last weekend we were already in a state that Hamas was on the verge of breaking, we saw large groups of Hamas members who turned themselves in - and it happened because we attacked them without stopping." "The rule against terrorism is that if you do not pursue terrorism, terrorists will pursue you," Elkin added. "Therefore this method of 'humanitarian ceasefire' breaks - even if they come under international pressure - is problematic. Hamas exploits the interval to organize itself and to continue its attacks." According to Elkin, investigations into the handling of incidents in Gaza must wait until after the operation ends. In the meantime, he said, Operation Protective Edge in Gaza must continue until the mission of destroying terror tunnels is complete. "We need to do a thorough cleaning of Gaza and stop Hamas firing [rockets]," he urged. "We're far from achieving that, because Hamas feels stronger." "We must not end this while Hamas feels like it's accomplished something," he emphasized. Elkin also criticized Prime Minister Binyamin Netanyahu for acceding to world opinion in the touch-and-go ceasefire policy. "It was expected that our reputation would diminish [due to the operation], but that should not be taken into consideration by the decision-makers," he said. "We have a strong nation and the [bereaved] families themselves call not to stop." "We currently have two options," he continued. "We can either take the initiative and increase pressure on Hamas - and beat it until it begs for a ceasefire - or continue this on-and-off process and slowly fight it out." "The first option is effective - we must continue until Hamas waves a white flag," he declared. "We have to finish this decisively because otherwise we will live in a very dangerous reality." Elkin concluded with a warning that Israel, not the international community, needs to directly demilitarize Gaza. "Anyone who thinks the international community needs to demilitarize Gaza lives on another planet," he said. "I mentioned this to the UN Security Council at the end of the Second Lebanon War [in 2006], and we all know what happened in reality." "Today they have 100,000 rockets, ten times what they had before," he said. "You cannot rely on international forces."